As Zoos Victoria Members, we often visit the 3 Zoos around Melbourne, whenever we have a spare couple of hours. We usually pick a few favourite animals to see and keep our regular visits fairly short. I'd read about the Magic Moments wildlife encounters, and was very interested in meeting the beautiful Dingoes at Healesville Sanctuary. 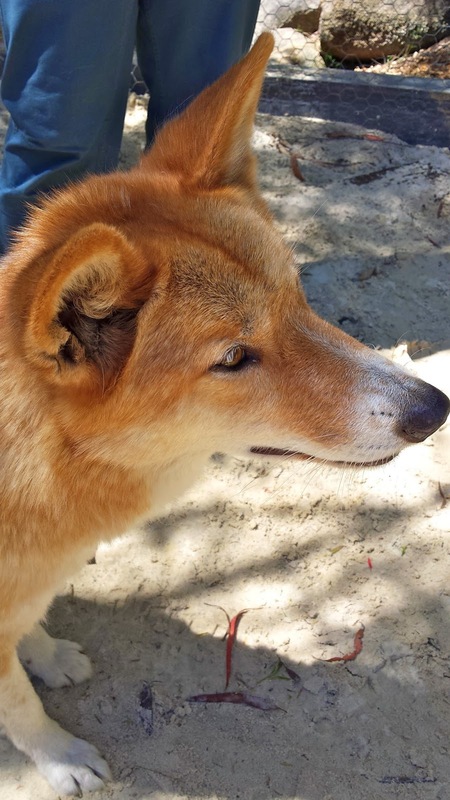 On my way to the Dingo enclosure, I happened to meet one of the latest arrivals to the Sanctuary, a Tropical Dingo puppy. 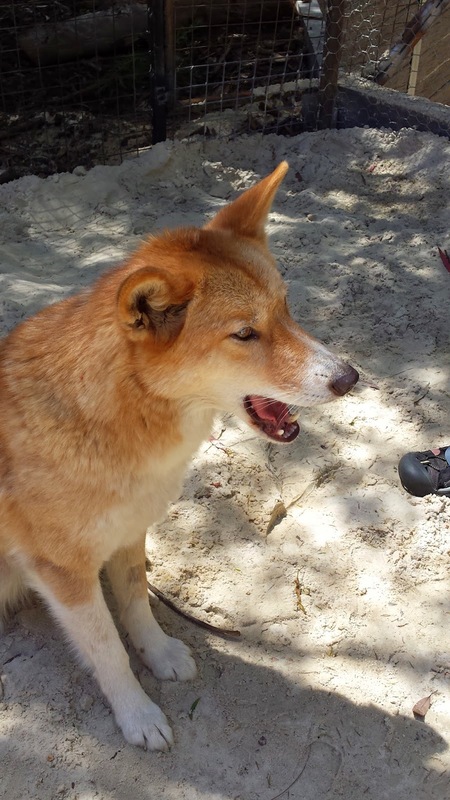 She and her sister are the first Tropical Dingo pups to arrive at the zoo. She was out for a walk with her keeper and was very excited and happy to stop for a quick chat and to plant a big slobbery kiss on my hand. (No chance for a photo of this gorgeous girl, unfortunately). 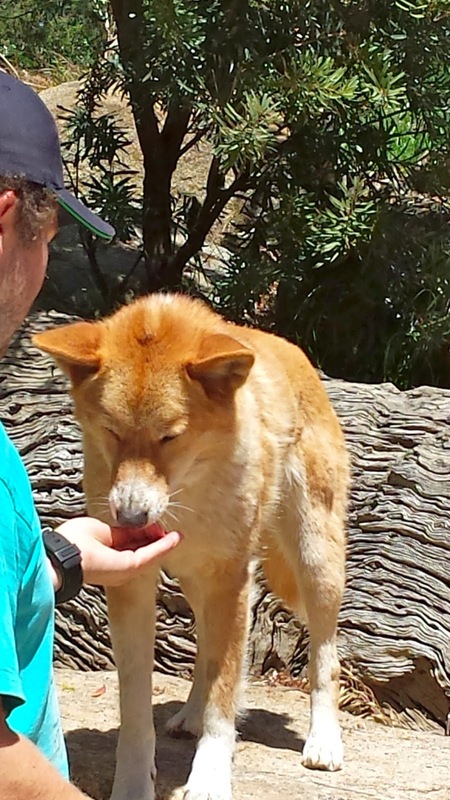 The great thing about Healesville Sanctuary is that you will often see young animals walking around with their keepers, letting them get to know their environment as well as giving visitors a closer look at them. 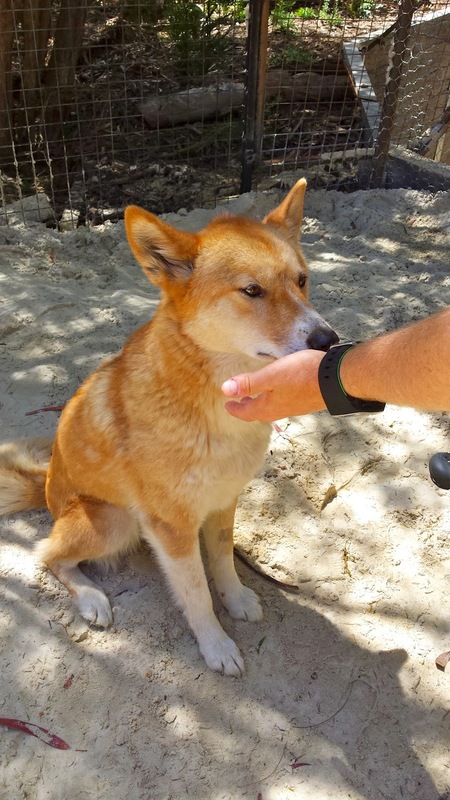 We've seen a baby Tasmanian Devil wrapped up in a blanket, a baby Wombat shuffling about on the path, and now this Dingo pup. 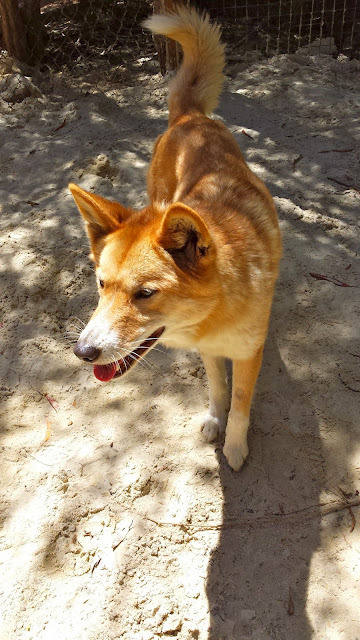 Alpine Dingoes are the current residents at the Zoo. They are bigger than their Tropical cousins, with a rougher, thicker coat for the cooler climate. I phoned and booked my Magic Moment before I arrived and there was only one other person in my group. We were given a safety induction before heading into the enclosure to meet Omeo and Dargo, along with 2 keepers. They were immediately friendly and enjoyed being patted on their backs - and the other lady in my group received a big wet smooch on the cheek! The 10 minute encounter was a great way to get up close and personal with these beautiful animals, with lots of pats and photo opportunities. Highly recommended.